Groups must successfully navigate their way through the square without losing too many valuable resources. This requires strategy, coordination, and flexible problem solving. Create a square boundary (you can use rope, cones, or chalk) large enough for your entire group to fit comfortably and move around. 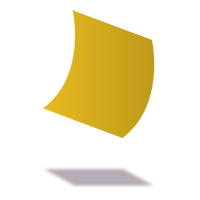 Designate entrance and exit spots outside each of the four corners of the square and mark them with tape or a polyspot. Place more spots around randomly inside the circle, your group will use these to maneuver through the square. You should have as many or fewer poly spots than group members (but not more). Break up your group into four teams. This game is best played with 20-30 people but can also be played with smaller or larger groups you just may need more time, space, and supplies. Situation: Your small group will need to enter the square by first stepping on the spot outside the square. Then, you will need to use the spots inside as stepping stones to make your way through the square to your designated exit spot. 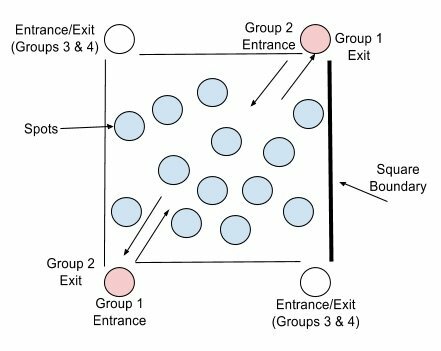 Each group’s exit is the spot diagonal to their entrance. Enter and exit by stepping on the corner spots. Spots are used for crossing – ANY body part, such as a hand or foot, contacting the ground must also be in contact with a spot. “Illegal” contact with the ground requires that person to go back to their beginning spot and reenter. A spot is ‘activated’ by contact. Once activated, loss of contact with that spot results in loss of the spot. Loss of too many spots to complete the activity safely results in “shut down” and the group starts over with all spots replaced. ALL participants (from all four groups) must be in the square before anyone may exit. The boundary and spots may not be moved. Time the activity and see if the group can beat their previous time. Silence the group and have them finish the activity without using verbal communication. See also Stepping Stones and Four Points.